The Danforth is a vibrant Greek neighbourhood in Toronto. Danforth is also the name of a play debuting at SummerWorks, written by Adam Hunter Collier. Danforth is a “day in the life”, a snapshot of a tightly knit group of friends and family. Most of the characters are young males. As a result, there’s a lot of chest-thumping and locker room humour. There are lots of boys talking about cars too. All of the actors are great. However, I thought there were too many of them. Just as we start to know one, there is a new scene with new characters. I almost want to call it a “cable news play”. It seems to me like everything is blown out of proportion. It feels like there is no context, and everything is forgotten after a commercial break. Even when I start to know a character, I often don’t want to. I turn my music up to avoid hearing things like two boys explaining to each other why they painted lips around the gas door cover on their car. Danforth turns this discussion into one of it’s longer scenes. There are other times when I wanted to turn things down. I tried to pay attention and respect the rest of the audience. One person in the audience had other ideas. He thumped his chest and behaved like Robert DeNiro in the theatre scene in Cape Fear. I wish I could have turned the volume of this person down. I’d also like to apologize to him for crashing his private party. I really wanted to like Danforth. In the summer, Toronto is the greatest place on earth. I’m on board with anything that celebrates this idea. Danforth could be anything though. It could be my cousin and I sharing jokes about our youth in Little Italy in Niagara Falls in the 80’s. Danforth is essentially My Big Fat Greek Wedding from a boy’s perspective. A man in his 20’s finds a nice woman and thinks about leaving the neighbourhood. I saw Danforth on Saturday afternoon, and I was delighted. It was sweet, charming and funny. It made me want to go sit on the Danforth for a cappuccino and watch the world go by. For a one act, forty-five minute play I definitely got my money’s worth. Danforth the neighbourhood and “Danforth” the play, should not be confused. This is a play about some of the characters that those of us who have grown up on The Danforth have had the pleasure of knowing over the years. They’re charicatures of real people, with hilarious, stupid, and yes, offensive words put into their mouths by a talented writer. It’s embellishment for comic effect, not meant as a representation of the whole neighbourhood, or all the people in it. I saw the play on opening night and the audience was howling with laughter throughout the show. There was no chest bumping, though I’m not sure what that sounds like so I can’t be certain. The actors were fantastic, and though there were a lot of them, they were all recongnizable as embellished memories from my past. I liked it a lot. I thought it was funny, and the audience on opening night laughed throughout the show. The actors were great, and it seems to me like characters are clearly meant to be exagerrated versions of people from the neighbourhood. I’d also like to say that though it’s a comedy, it’s still a better representation of the area than the “Taste of the Danforth”. It’s also a lot funnier, and less expensive. I had been looking forward to seeing DANFORTH ever since I heard a little about the plot. As a ‘non-ethnic’ person who grew up on the DANFORTH many years ago I hoped that my memories of the many interesting people I grew to know and love would be resurrected. I was not disappointed. I agree with the comment made that of all the actors were great but I totally disagree with the comment that there were too many of them! I felt that I got to know each of them well from the hilarious young man in the roller blades, to the soccer jock with frosted tips, to the two actors who portrayed young Greek woman extremely well. In my opinion they all accomplished what the playwright had hoped they would – a snapshot of life on the DANFORTH! In fact I would have enjoyed meeting some more characters that I know live on there! I will say that while George did a fine job of transitioning the group from scene to scene, unlike the other actors it was difficult to believe that he was a Greek waiter. Perhaps his character could have been reworked to make him more of a ‘newcomer’ to the neighbourhood. His perspective in this way could have been hilarious! 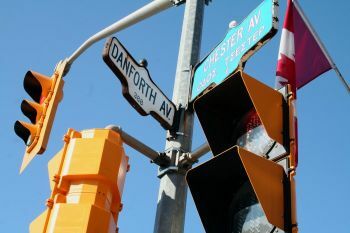 If you have spent time observing life on the DANFORTH you would not feel that it was “blown out of proportion”. I’m sure I’ve seen George, Kostas, Angelo and Peter out there on the street with their handcream, their mother’s tips about the value of lemons in gingerale, their soccer uniforms and of course their frosted tips! Congratulations to Adam for creating a fabulous script, to Becca for pulling it all together and to everyone else for a job well done! I completely disagree with the above review of DANFORTH and feel that the reviewer has completely missed the point. I am happy to see that others who have seen the play and left their comments here seem to feel the same way that I do. It was a delightful evening of entertainment, and I applaud the talents of all involved. The simplicity of the production served to highlight the talent of the actors and the dialogue brought to life a neighbourhood that is rich in culture and full of charcaters. The evening that I attended, the theatre was packed and it was obvious during the performance that everyone was enjoying the play. The comments that I overheard from others as we were leaving the theatre indicated that everyone had a great time and that, to me, is the point of this production. Kudos to the cast and crew!! James – Nice. I actually snort-laughed when I read your comment. While I assume you’re joking, just in case it wasn’t a joke, I should clarify that the writer was speaking in terms of when he is in public and overhears that kind of thing. You had trouble getting to know the characters? I’m assuming you have a short attention span. It was only 45 minutes long and a well spent 45 minutes at that. I thoroughly enjoyed it. I wasn’t the only one in the audience enjoying it either. Too bad, you seem to have missed out on a good laugh. I was engaged and charmed by the cast and humourous dialogue. I enjoyed reading the other favourable comments. I did believe George as the Greek waiter because my son has a friend with a mixed background, his father is Greek and his mother is Japaneese and he is a by product of the Danforth experience. The comments in the play about the mother reminded me of my Portuguese Mother in Law! Loved it, would see it again. I also disagree with the observations you made in your (somewhat superficial) review. While there were a lot of characters in the play, the pacing did not feel at all frenetic—we got to know each and every one of them. In fact, while you suggest that “everything is blown out of proportion,” I felt that many of the scenes were true to everyday life: they were either silly or contemplative. You think “Danforth could be anything,” except not really, because you go on to compare it to your youth in Niagara Falls’ Little Italy, which is actually somewhat specific. The play is precisely about the comedy and pitfalls of being young in an insular, culture-specific community in North America. The fact that you’re comparing it to your own similar experience just speaks to the success of the play at capturing that experience. I’m not sure what a chest-thumping audience member has to do with the quality of Danforth, nor how the comparison to My Big Fat Greek Wedding clarifies your opinion of it. Did you like MBFGW? It was pretty popular.